This Quality Sign Supply is In Stock Now! Buy Sign Making Equipment Online and Save with Wholesale Pricing! 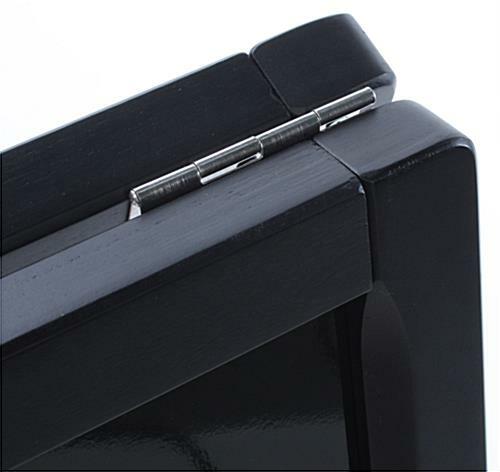 Black wood frame coordinates with any business setting. 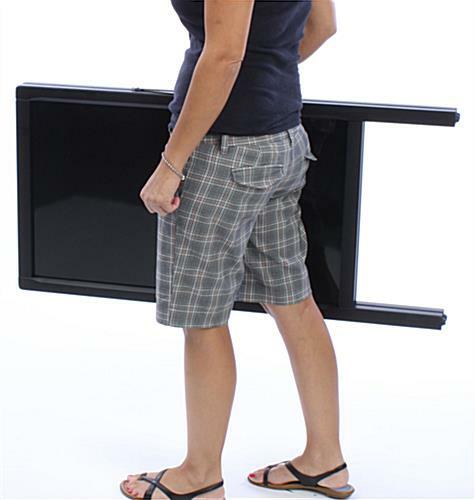 Features hinged sides for easy storage. 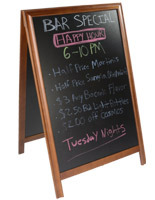 Double-sided blackboards draw the attention of passersby from multiple directions. 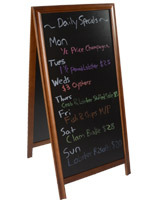 Glossy blackboard surface for use with wet-erase or liquid chalk markers - not for traditonal chalks. The functional design of this sign supply makes it the perfect choice for every business. 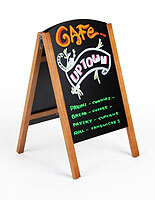 The write-on sidewalk sign works well in food service and retail environments. 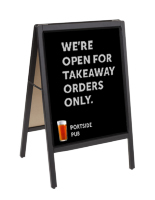 Perfect for businesses that routinely change messages, this sign supply is often seen presenting "Today's Menu", "Drink Specials", or "Clearance Sale". These sign making kits are also great teaching tools and can be found in schools and training rooms. This sidewalk display, wood sign supply is easy to carry at just 13 lbs. making it a great portable sign supply that can be moved easily to wherever it is needed. 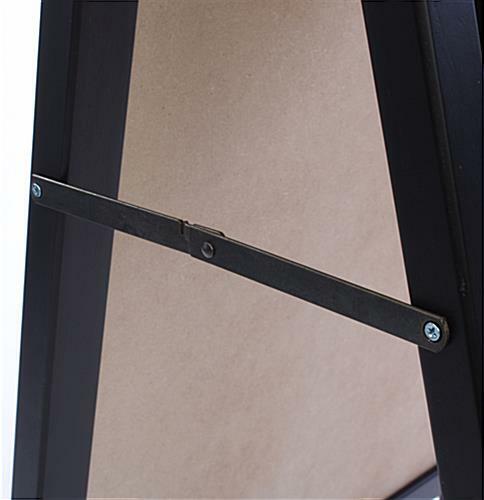 The hinged sides of these displays also close so the sign can be collapsed flat for easy storage. This sign supply is an ideal marketing tool for every business. Each sign supply is great for advertising a variety of messages including special sales, events, promotions, new arrivals, daily specials, and much, much more! Just write the message on the surfaces and set out the display! Changes are made easily by wiping the message with a damp cloth and then simply writing out the new message. This menu board, sign supply, is a low-cost wood sign with a black finish. The neutral black finish easily matches every décor. 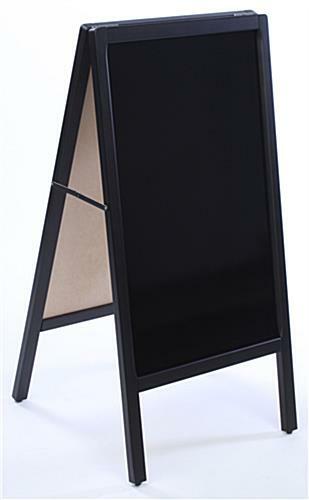 This indoor sign supply, also called a write-on board, is double-sided, allowing for advertisements to be seen from multiple directions! 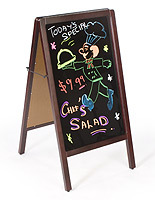 The glossy surfaces are designed for use with wet-erase or liquid chalk markers. As the surfaces are black, neon markers are suggested. The neon colors against the black background really stand out so everyone will notice your message! This sign supply features a 16-3/4" x 28-3/4" write-on area, which is ample for the creation of distinctive custom advertising. 19.8" x 38.8" x 20.0"